Crystal River Preserve State Park: You will feel like you just stepped out of a postcard or a nature magazine in this picturesque park that offers so much beauty and opportunities for exploration. Crystal Park is known as the City of Festivals so come party with the natives of the area. Not to be confused with Crystal Beach on the Panhandle, this park is located about two hours north of Tampa/St. Pete on Florida's fabulous nature coast. Crystal Park offers exciting and unique nature trails, such as the Eco-walk Trail, a 2.5 mile trail that offers 11 Discovery Zones. Educate yourself and your kiddies while you explore various natural habitats and types of nature. Get lost in the natural beauty of one of the nature scenes or just plant yourself on the white sandy shore and enjoy scenic ocean views. 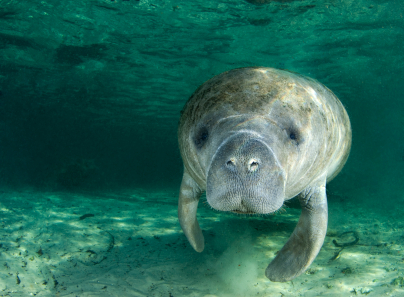 Keep an eye out for manatees in the Crystal River- they are known to inhabit the river in large numbers. Crystal River Preserve State Park makes it possible to see so many different types of animals and wildlife because of the rare climate variances. Some parts of the park are temperate while others are sub-tropical, so animals and plant life from various habitats inhabit the park. At the visitor center, you will learn about all of these different habitats with 6 huge dioramas depicting details of each climate. Crystal River Archaeological State Park also lies within Crystal Reserve. Here you can see burial mounds, temple/platform mounds and other interesting things left behind by the Native Americans who used to perform ceremonies and other customary rituals here. The museum is an important part of the park because it allows visitors to explore the archaeology, lifestyle and history of the Native Americans that were here first. What to Do: Crystal River offers many great activities for the whole family. Take your teenagers to Bird’s Underwater where you can take a snorkeling trip and swim with manatees. Offers an incredible and unforgettable experience for all ages. Where to Eat: The City of Crystal River offers lots of dining options. Grab a quick and “extraordinary” (according to tourist diners) lunch at the Crystal River Tea House. Where to Stay: There are also a number of hotels in Crystal River. For simplicity and a central location, enjoy a stay at the Quality Inn Crystal River.